The rib eye or ribeye (also known as Scotch fillet in Australia and New Zealand) is a beef steak from the rib section. The rib section of beef spans from ribs six through twelve. Ribeye steaks are mostly composed of the Longissimus dorsi muscle but also contain the Complexus and Spinalis muscles. A rib steak is a beef steak sliced from the rib primal of a beef animal, with rib bone attached. 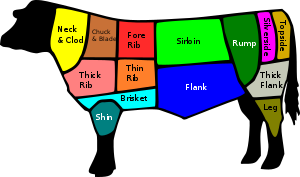 In the United States, the term rib eye steak is used for a rib steak with the bone removed; however in some areas, and outside the U.S., the terms are often used interchangeably. The term "cowboy ribeye" or "cowboy cut" is often used in American restaurants for a bone-in rib eye. The rib eye or "ribeye" was originally, as the name implies, the centre best portion of the rib steak, without the bone. In Australia, "ribeye" is used when this cut is served with the bone in. With the bone removed, it is called "Scotch fillet". It is both flavourful and tender, coming from the lightly worked upper rib cage area. Its marbling of fat makes it very good for slow oven roasting and grilling. Page modified 08:56, 14 May 2017.